The official launch event celebrating five years of Rye News is just a couple of weeks away, so we thought it was timely to reflect on our journey and the lessons we have learnt. We hope that, together, we can explore ways of not only surviving another five years but making Rye News better and reaching a larger audience. The concept of running a non-commercial online news project came from Kenneth Bird at a time when local newspapers were shrinking and giving very little coverage to issues in the Rye area. Funding was sought and with the guidance of Tony Nunn, an ex-editor at The Times and Mark McGee, a web developer, Rye News was born and the journey began. A team of eager volunteers, who supported the idea of giving locals a voice and providing a forum of debate, was recruited. Tony Nunn and his wife Jane, also a journalist, set very high standards for us so there was an inevitable explosion of exasperated emails, but we learned a lot. Creating a new project like this has been a learning curve for us all and raised many interesting issues. Unlike national papers, where the political stance is clear at the beginning and driven by the proprietor and editor, Rye News aims to be politically impartial but there are the inevitable complaints that it is “too right wing” or “too left wing”. Investigative journalism is invariably going to have political implications which don’t always sit comfortably with partnering and supporting local organisations. So getting the right balance is a juggling act. For those used to printed news, creating an online project has been a challenge. It isn’t just about writing articles, but analysing who is reading them, where are they from, which pages/articles are most popular and of course learning how to use and exploit the vast potential of the software we use, called “WordPress”, when we are not all as web savvy as we might be. Google statistics show us that our readers are not just locals, so our response with the new site has been has been to add a Visit section where we will offer services for visitors and in so doing, support businesses involved in the tourism sector whose adverts will not have to sit alongside controversial news items. The data shows that we have few young readers, so we have added a Jobs Vacancy page which we hope local employers will support so we can attract young readers and contributors. We would also like to see more articles contributed by the younger generation. National issues generally filter down to local issues – social media being one example. We want to encourage debate but it needs to be respectful and relevant to local issues. The comments policy has evolved in line with legislation and if comments are personal or offensive, they won’t be published which has sometimes upset readers. We have also found ourselves part of the national debate about the impact of second-home owners or DFL’s (down from Londoners) on the town. Several of the Rye News team fall into one of these categories and yet willingly give a lot of their time to help support the community they love and feel part of. Where we go now is in part up to you. If we are going to reach a larger readership and provide a more comprehensive service to the local community and visitors, we will need money to pay for editorial, administrative and marketing support. We need to raise income through sponsorship, advertising and donations to ensure that Rye News becomes sustainable. 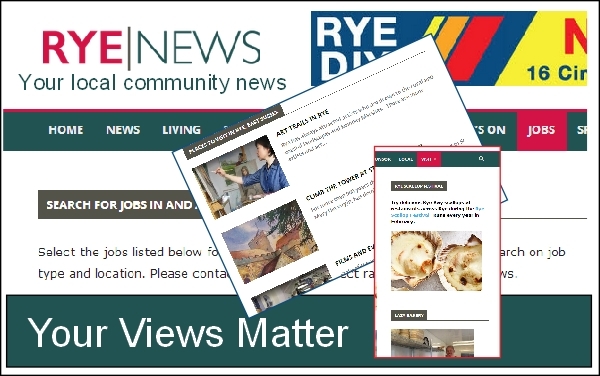 Residents will have access to a wider range of local news and issues concerning them and businesses can promote their services at a very reasonable rate knowing their message is reaching a wide readership and that their contribution supports Rye indirectly. We hope those of you invited to the event will join us on November 16 to hear more about our plans and we welcome the views of all our readers, and of course we still need volunteers with a range of skills. Come and join us and influence the next stage of the journey.